--Thursday Morning... Clouds rapidly increase across New Jersey. Temps in the upper 20s. --Thursday Afternoon... Scattered rain showers bubble up from the south. Nothing heavy or overly hazardous just yet. Temps in the mid 40s. 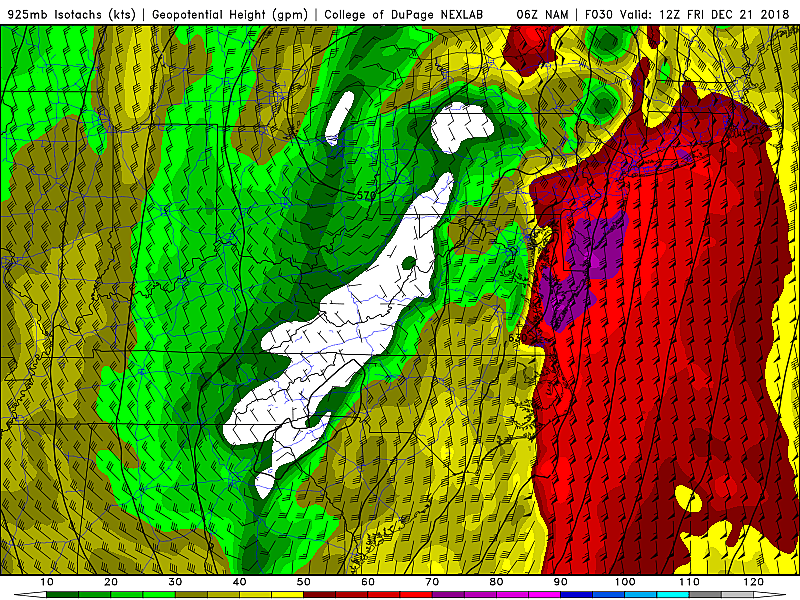 --Thursday Night... Steadier, heavier rain arrives as wind gusts increase dramatically. Temps continue rising into the 50s overnight. --Friday... Periods of heavy rain and gusty winds continue. Near-record high temps in the 60s. --Saturday... Showers taper off in the morning, perhaps with a few snowflakes in NW NJ only. Then clearing skies and a gusty wind. Temps falling from the 40s to the 30s. A rich plume of tropical moisture will make for a very wet 24 to 36 hours across New Jersey. It's really going to pour! A widespread 2 inches of rain (give or take) is expected from north to south and west to east. Locally higher amounts above 3 inches are possible too. That's a lot! And that's more than sufficient to cause flooding of roads, rivers, streams, and creeks. --7 p.m. Thursday to 1 a.m. Saturday... Morris, Sussex, and Warren counties (2 to 3 inches of total rainfall). --1 a.m. Friday to 1 a.m. Saturday... Bergen, Essex, Hudson, Passaic, and Union counties (2 to 3 inches of total rainfall). If Atlantic City International Airport receives 1.22 inches of rain — almost a certainty — 2018 will best 1948 as the wettest year on record for the Atlantic City area. Year-to-date precipitation is running more than 2 feet above normal. The potential is there for some really fierce winds. Well, let's be more specific — winds will be very strong in the lower part of the atmosphere. If those winds mix down to the surface, gusts to 40 mph (inland) and 50 mph (coast) are possible. As we've already seen this week, such gales are enough to blow around garbage cans and Christmas decorations, bring down tree branches and power lines, and make driving difficult. By the way, the prominent wind direction here will be southeasterly. Therefore, this storm is not a "nor'easter". A Wind Advisory has been issued for all or part of 9 coastal NJ counties, calling for a period of sustained winds in the 20 to 30 mph range with gusts to 50 mph. That advisory covers Atlantic, southeastern Burlington, Cape May, Cumberland, Middlesex, Monmouth, Ocean, and Salem counties. Watches, warning, and advisories for NJ as of Thursday morning. 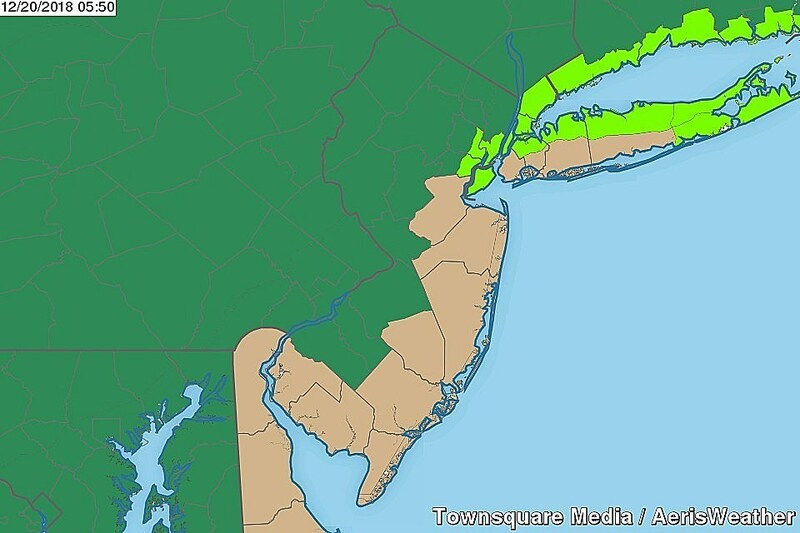 Dark Green=Flood Watch, Light Green=Coastal Flood Advisory, Tan=Wind Advisory. There are two factors at play here — the storm's strong on-shore flow, and the impending full moon (on Saturday). 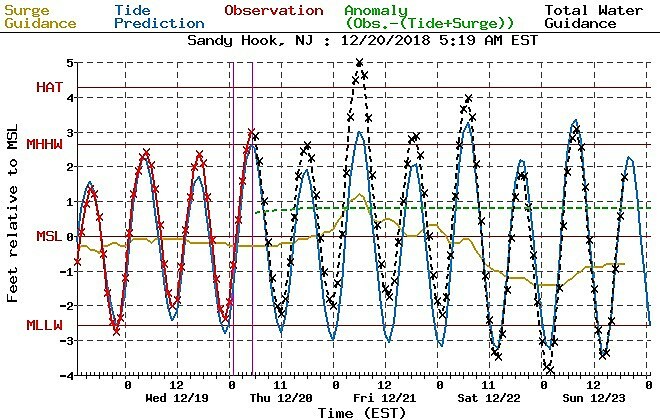 That will result in a 2-foot rise in water levels during Friday morning's high tide cycle. Such a tide level could cause widespread minor coastal flooding, which I call "the usual spots and then some". Be sure to obey any road or lane closures, and never attempt to drive, swim, or walk through flooded areas. So far, a Coastal Flood Advisory has been issued for eastern Essex, Hudson, and eastern Union counties only, from 5 a.m. to 8 a.m. Friday. I expect that advisory to be extended farther south along the Jersey Shore at some point. Friday is the first day of Winter, the shortest day of the year — the Solstice officially occurs at 5:23 p.m. EST. But the threat for anything snowy or icy from this storm system is going to be severely limited, with near-record warm temperatures expected. 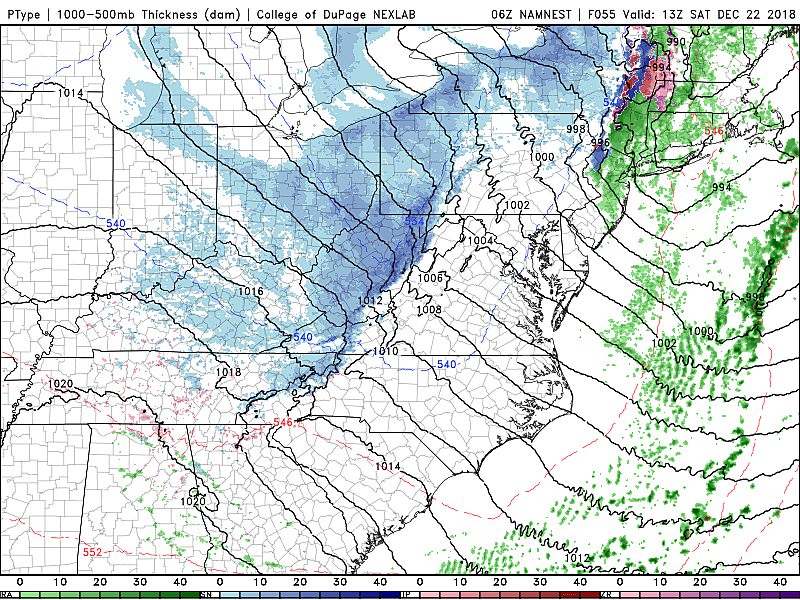 The only exception will be the very tail-end of the system on Saturday. As colder air starts to return to New Jersey, I could see some snowflakes in the northwest corner of the state. Again, any wintry weather will be geographically limited and light. Given the wet, relatively warm ground, no accumulation or travel issues are expected. Just a quick burst of snowflakes flying around. Behind the storm on Saturday, winds will shift from southeasterly to westerly. That's going to be a chilly, brisk wind gusting to about 35 mph. Temperatures will fall from the 40s into the 30s during the day Saturday, as skies rapidly clear to sunshine. Sunday looks quieter, with partly sunny skies and slightly-above-normal high temperatures in the mid 40s. I suspect it will still be a bit breezy. The GFS model shows a weak wave passing through New Jersey Sunday night through Monday morning. So I'll include an isolated shower (snow NW, rain SE) in the forecast, just in case. Silent forecast. Holy forecast. All is calm. All is (mostly) bright. Christmas Eve looks partly sunny and a bit breezy, with high temperatures in the lower to mid 40s. Christmas Day will bring mostly sunny skies and highs again in the lower to mid 40s. While New Jersey missed out on a White Christmas yet again this year, you really can't complain about a quiet forecast given for all the travelers, carolers, and revelers. Hopefully you get the sense that we've got a nasty storm on the way. Rain and wind will almost certainly cause travel disruptions for the start of the big Christmas holiday weekend rush, whether you're traveling by land or by air. You may want to consider your plans carefully, keeping in mind our weather quiets down significantly after Saturday morning. Given the timing and impacts of the storm, I am canceling my day off for Friday. I'll be back with the very latest on-air and online dark n' early in the morning!